Published Jan 13, 2015 by Peachpit Press. Part of the Learn by Video series. A common struggle facing IT staff is how to properly manage iOS devices once they are in the hands of the user. Distributing applications was a constant burden faced early on as well. But as Profile Manager enters its fourth iteration, many advancements and capabilities have been incorporated in to the service. Apple's Device Enrollment Program (DEP) can supervise and enroll devices over the air and can be critical in ensuring your devices stay under your control. The Volume Purchasing Program (VPP) can allow an organization to purchase apps and books and, with the use of an MDM like Profile Manager, silently push those apps to your devices. This video covers the process of acquisition of iOS devices using the Device Enrollment Program. 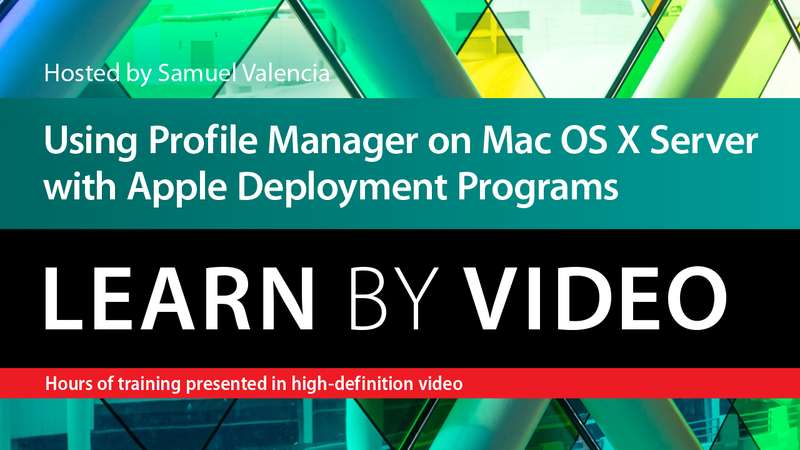 It also shows how to enroll devices in Profile Manager and how to distribute applications and books using the Volume Purchasing Program.